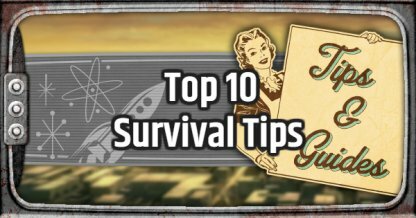 Learn how to survive in the wastelands of Appalachia in Fallout 76 with this top 10 survival tips guide! 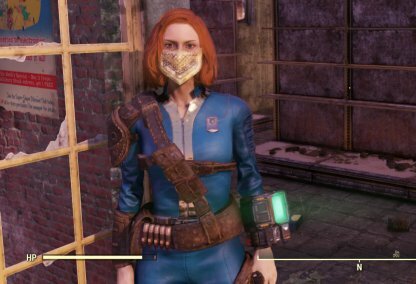 Information on best weapons, what to do first, stashes, power armor, and more included. In the game there are a several number of Quests which have been divided into their own categories. These categories are the main, side, daily, and event Quests. These may be one of your main objectives when playing the game. 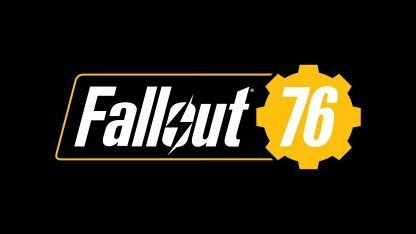 Fallout 76 features a new open world in Appalachia, and allows you to team up with other players to take down enemies and complete Quests! You will find other players all accross the map, and you can team up with them, or fight them! 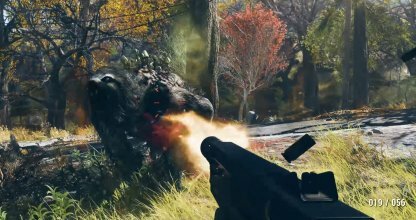 Fallout 76 offers players an alternate reality to explore. 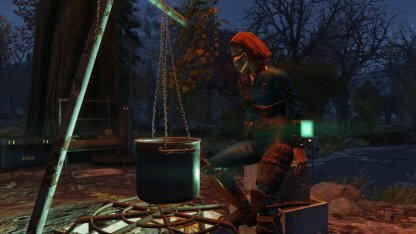 A different West Virginia, a post-apocalyptic Appalachia! Take time to explore the different sceneries, and find every little secret there is to uncover in the game! Satisfying your hunger and thirst will give you bonuses such as disease resistance, AP regen and more! It is recommended to loot everything from meat and water to junk while traveling. You can craft with these items later on! 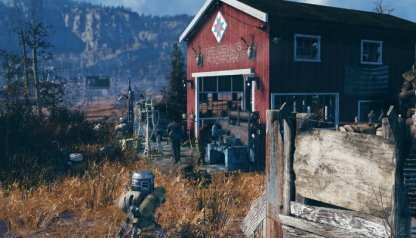 After looting anything that you can get your hands on, visit crafting stations such as workbenches, or cooking stations. Here you will be able to craft items from the junk you've collected. Gather meat from animals, and water from bodies of water and find a cooking station to be able to cook food, and drinking items. You will also need to gather some wood to be able to cook these items! Vendors around the map will be willing to trade with you. 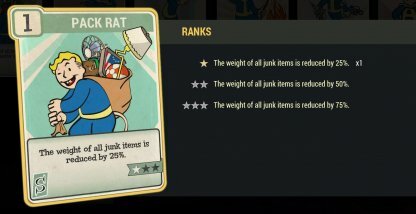 You can sell them your unwanted junk in order to earn more caps! Keep an eye on the weight of your character. Carrying too much items can result in your character becoming overencumbered. Making them move slower, and blocking fast travel to other areas. The Stash is found in your CAMP and will have a large carrying capacity. This will allow you to store lots of items that takes up a lot of weight in your inventory. Be sure to visit the CAMP often to frequently free up space in your inventory. 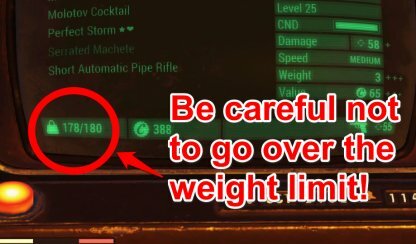 Being in your Power Armor will increase the weight of items that you can carry while exploring. Remember to have fusion cores as Power Armors require these to operate! There are some Safeboxes out in the world that do not save your items when you log out of the game. Make sure that the Safeboxes you are storing your items in are from your CAMP stash or else they will be gone the next time you log in! 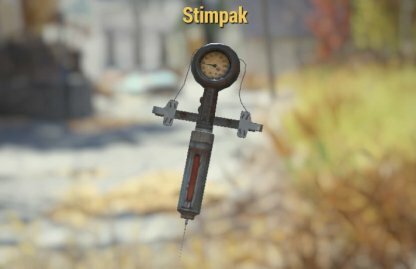 Beware of suddenly using a Stimpak at times since there is a button that will automatically use a Stimpak. By being careful, you will minimize the number of Stimpaks you use by accident. There will be many strong enemies that can do a lot of damage in the game. When going up against these opponents, it would be advisable to equip the Born Survivor Perk Card to automatically heal you while fighting them! Fast Traveling is a convenient way to get around the map. 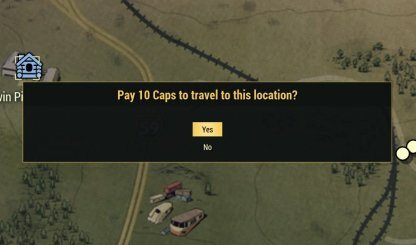 However, it will cost you some caps, and will cost more when the location you want to travel to is further away. It is recommended to fast travel only when it is needed. 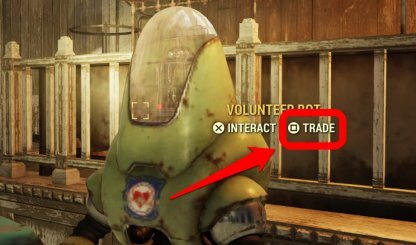 You can Fast Travel for free when going to Vault 76, your CAMP or to your teammate. 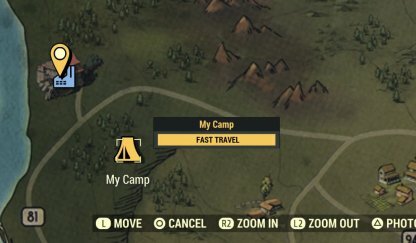 Make sure that the CAMP is far away from the Vault to make the most out of the free way to travel! Your CAMP will serve as a place to help you rest, and craft items. You will be able to create weapons, armors, food, and more in your CAMP. 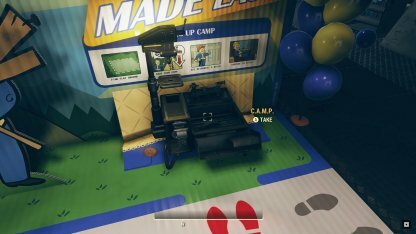 Just make sure that you have the different workbenches and cooking station built in your CAMP. When building in your camp, you will need some materials to make some of the structures. You can gather these resources by going to any workbench and scrapping the junk you've found while exploring! 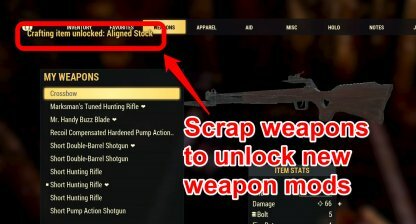 Scrapping your weapons is also a good way to unlock different modifications for that specific weapon. Be careful not to scrap any valuable weapons as you can't get those weapons back when scrapped! Other than having ranged weapons, it is also recommended that you have at least one melee weapon for those close range encounters! 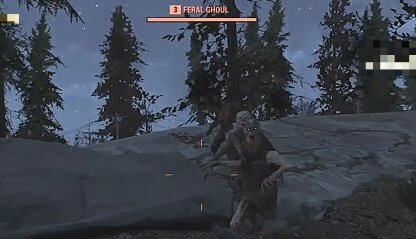 These are useful for silent kills, and can do more damage when wielded in power armor! Armor is a useful piece of gear when you are out adventuring they reduce either ballistic type damage, radiation type damage, or energy type damage. Equipping them will make you tougher, and let you absorb lots of hits. Make sure to have the right armors equipped for the enemies that you will face. For example, wearing leather armor against enemies with laser weapons will negate lots of damage for you. 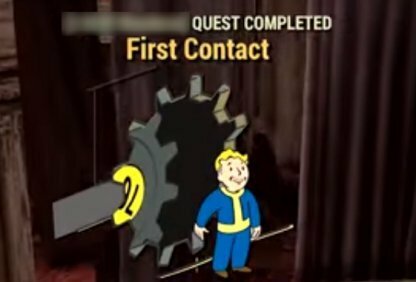 Armor can generally be found while exploring Appalachia. They can be found out in the world, dropped by enemies, in lootboxes and more! Keep an eye out for these armors to help protect yourself from the dangers out there! The condition of armor degrades as it takes more hits and time passes by. When the condition bar is empty, it will break, offering you no damage resistance. 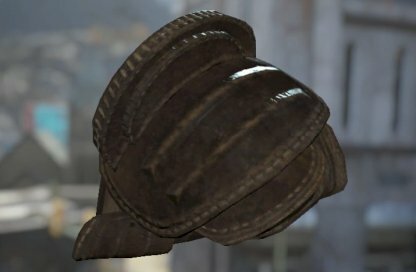 Make sure to repair these at armor workbenches! 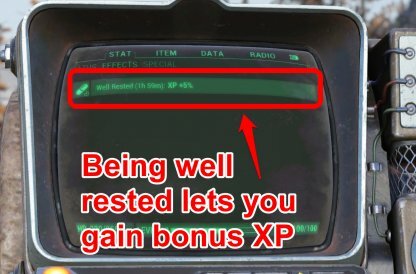 Power Armor is another type of armor that you can enter to give you extra damage resistance, and more benefits. Power Armor allows you to increase your carrying capacity, letting you hoard more items in your inventory. They also add a few points to your strength SPECIAL allowing you to be more lethal with melee weapons. Power Armors are powered by fusion cores. If the fusion core is empty, you will move slower, won't be able to use VATS, and run. 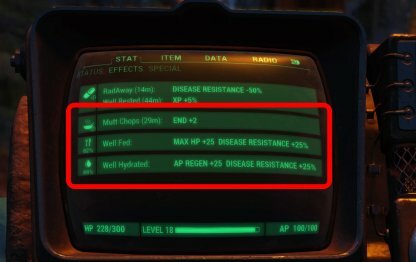 Make sure that the power armor is powered by a fusion core when using! One of the first things that you may need to do is to level up as fast as you can these will help you equip higher leveled items in the game. Below are a few ways for you to level up! Resting on your bed will grant you a rested bonus. This will give you an extra percentage of XP gained for a limited amount of time. If you are looking to get stronger fast, it is recommended to get some rest! There will be areas where a large amount of enemies spawn. These are great places for you to farm some XP and level up faster! You can also visit again these areas as enemies respawn after a few minutes or when you log back in! 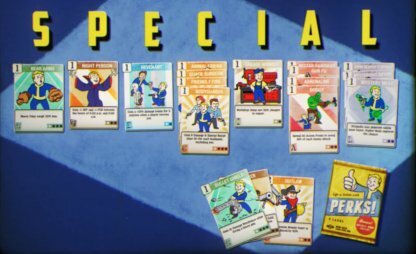 Your SPECIAL is comprised of seven attributes that will help make exploring the wasteland easier for you! SPECIAL is comprised of Strength, Perception, Endurance, Charisma, Intelligence, Agility, and Luck! Perk Cards are abilities that you can give to your character after leveling up your SPECIAL attributes. These Perk Cards give you bonuses such as taking less rads, doing more damage with rifles, and more!